Baird is a top 10 trader of many companies our clients already associate with our award-winning research coverage. 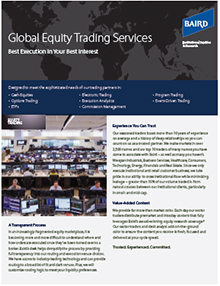 Our sector traders and desk analysts take these ideas and add on-the-ground intra-day viewpoints to ensure fresh, focused content at the appropriate cycle speed. We provide full transparency into routing and execution venue choices, with unbiased routing to a broad list of lit and dark venues. And we can customize routing logic per our clients’ liquidity preferences. Because Baird has no dark pool or proprietary trading desk, we have no ownership interest or bias regarding execution venues. We focus solely on best execution in our clients’ best interests.